We recently hosted a film crew from the States who made this small video for us. They were over basically for the birds of the area, and will be making a full length film about them that I’ll post up on the Quinta’s Birding Blog as soon as I’ve got my sticky little paws on it, but this short video gives a wonderful feel of the few days they were over and for the Alentejo countryside in this, the most beautiful period of the year here. Many thanks to Jeff Aderman and James Currie. Sunset-5322, originally uploaded by Paradise in Portugal. 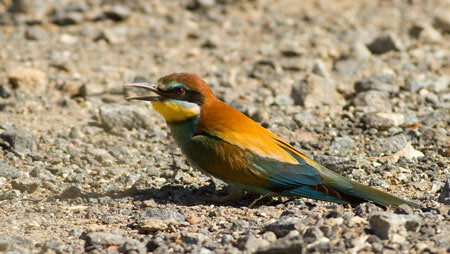 Bee-eater-5262, originally uploaded by Paradise in Portugal. 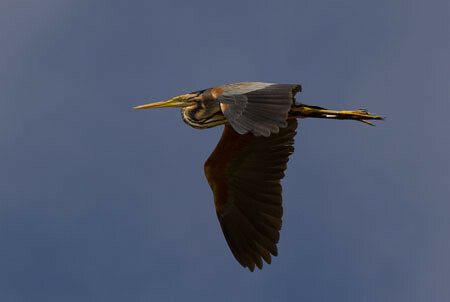 Purple-Heron-4361, originally uploaded by Paradise in Portugal. We went birding up on the Lagoa Sto André this morning, driving through heavy showers all the way, hoping against hope that the weather would be kind to us once we got there, and we must have done something right ‘cos it was beautifully sunny for the three hours we were there. Anyway, we saw loads and loads, but the best to be sure was this beauty flying right over us; they just don’t get much better …! A wonderful day today and made even better by the stunning views we were able to have of this gorgeous bird singing for us just outside the dining room window. ‘Nuff said, watch the video! Really hope you enjoy watching it as much as we did filming! Golden-Oriole-3967, originally uploaded by Paradise in Portugal. Another species to add to our “Ding room window” list – and what a species it is! I hope to be able to post a small film of it singing too.